If you’ve been reading here for any length of time, you know that my eldest daughter Jade has epilepsy, and that anti-seizure medications failed her, and that her seizure disorder is now wonderfully controlled with a very strict ketogenic diet. And in case you’re new around here, I mean strict. Jade gives new meaning to the phrase “clean your plate”. At the end of each of Jade’s meals, we use a spatula to carefully scrape every last drop of precious oil from her various bowls and utensils. It’s the fat that really controls her seizures, so we don’t want to miss any. We tried out various spatulas to varying degrees of success, but it was my sister-in-law Lindsay who introduced me to my all-time favourite: a Danesco spoon spatula. 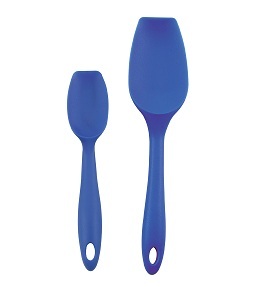 Made of silicone, with paper thin edges, this spatula outdid every other for scooping up every little drop. I loved it so much, Lindsay let me keep hers. When I came back to Whitehorse, I joyfully discovered that one local shop (Coffee, Tea & Spice) sold the same spatulas, and I scooped up two more. Now I had one for each meal! If I could only get one for each of her two snacks, I could go through a whole day without having to wash a spatula. But then… disaster. The clerk at Coffee, Tea & Spice told me that Danesco had stopped making those spoon spatulas, so they couldn’t order any more. I scoured the Internet for them, to no avail. No store carried these spatulas, and they weren’t even listed on the Danesco website. I found similar ones and ordered them, only to be devastatingly disappointed. Knowing I had come in several times looking for the spatulas, and knowing why I wanted then, the clerk at Coffee, Tea & Spice gave me the one she’d taken home for herself. And she wouldn’t even let me pay for it. Seriously, how completely generous is that? Now we were up to four. And my new friend Dorothy was visiting one day with her baby boy and she mentioned that the previous tenants of an apartment they’d moved into had left that very same kind of spatula behind. And her son was using it as a teething toy. (Horrors!) About a week later, though, she dropped the spatula off to me, saying there were other teething toys her son could use. Hurrah, we were finally up to five! I revelled in my spoontula wealth. Then, as seems to be the case whenever one’s star flies too high, disaster fell again! The edges of the silicone spatulas are pretty soft. First a little divot appeared on the side of the green one. Then a tear on the leading edge of a red one. Oh no! I used a knife to cut off the end of the spatula at an angle. It wasn’t as flexible as before, but it worked better than the torn edge. Then the other red one got a tear, too. We have at least 18 months, maybe longer, left on the keto diet. I wondered if we had enough spatulas to make it through. Knowing my spatula woes, my wonderful mother-in-law Marian had been collecting promising-looking spatulas whenever she came across one. Yesterday I opened a surprise package that had arrived in the mail, and in it was a whole array of new spatulas to try out! Coincidentally, I opened the Easter box my mother had sent, and it also contained a spatula. So much possibility and promise. A spatula blog post was definitely in order. After I’d transferred this photo, I realized I hadn’t taken a picture of my favourite Danesco spatulas. So I Googled them. Guess what? I found a website for a store in ALBERTA (meaning in Canadian dollars, yo!) selling my precious spoon spatulas. I’m glad to hear you found something to make everyday life a little easier 🙂 – still, your post reminded me how much efford & discipline it still takes to keep Jade seizure-free 😦 … Keep going !! Happy Easter – to all of you 🙂 !! … speaking of “making everyday life a little easier”: You used to have some “housewife website” on your blog list, featuring topics like “One chore a day” – I used to stop by occasionally, but can’t think of the name anymore 😦 … Is there any chance you remember … ?! Well, it’s great to hear that your spoons are starting to runneth over! Who knew that they would make for a great blog entry? Have a great Easter! Fantastic! I need to order some! I have same problem with Grace and her supplements, albeit it’s not as serious as yours, but a paper thin edge? Ooooo! Off to buy! Okay, not QUITE paper, but thinner than any other edge I’ve every seen on a spatula. They really are fabulous! I’m also a spatula aficionado and I can relate to your woes. The blue one in the bottom picture, I have, and I love it. Do you know if a ketogenic diet has merit for animals? Our dog has seizures. What are you going to do with all of the other spatulas! You should have a giveaway, lol.